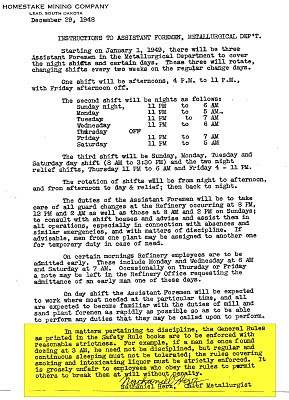 Hennen DHS56 sent historical information to share about his Dad Clifford Hennen. 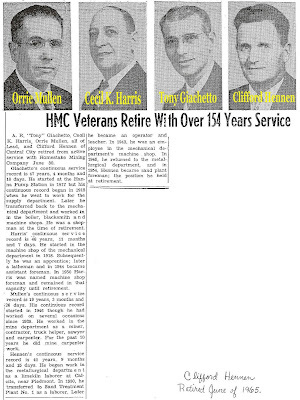 Clifford and three other long time employees retired from the Homestake Mining Company in 1965. Included is a short interesting history of each retiree that spans from 1918 to 1965. 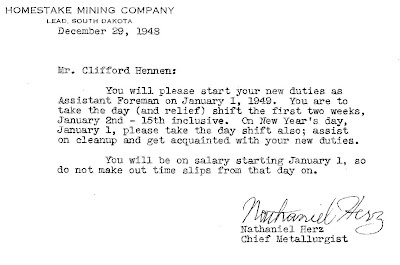 Clifford spent most of his career as a Homestake foreman at the Lead Sand Plant. The Sand Plant operation was located at the lower end of the Lead facility. It was a familiar sight next to the Lead-Deadwood highway even though many people did not know it's function. This Plant was the final step of Lead gold capture. The pond trapped the final fluid release from Lead site. The sand would settle and fill the Pond. Then cyanide solution was sprayed on the solid sand and the gold leached into another captured liquid. Zinc was added to this solution and the gold and the zinc would combine into another solid. This solid was captured by a filtering press. At certain intervals the press would be opened in sections. The solid was scraped out under guard and carefully monitored. This final solid was then smelted in the refinery process. The gold layer (and other precious metals like silver, platinum, etc.) in the Smelter furnace was claimed and poured into bricks. Sadly, in the old days, the cyanide and toxic solids run down Lead Hill and into the Whitewood Creek which we called one in the same, "Cyanide Creek" or "Slime Creek". In later years, environmental laws prevailed and the Homestake applied new technology and new mining methods. They invented and patented a microbe that would eat and eliminate cyanide. The final fluid release was clean water. The toxic Whitewood Creek was finally cleaned to it's current state. Open leaching was discontinued and the Slime Plant (similar process) in Deadwood was closed. In 2002, operations ceased completely after 125 years of mining and the Homestake was sold to Barrick. The US Government now owns the Homestake property and has a Deep Underground Science & Engineering Laboratory ("DUSEL") and all the 125 years of pollution cleanup responsibility . . . thanks to then SD Senator, Tom Daschle. There are many future articles that can be written about the Homestake Mining Company. One of my missing dhsclassmates' articles is about the Chinese cultural contribution to the pre-1930s Deadwood. Culture is defined as a diverse set of activities characteristic of all human societies. There are a lot of copyright information/images available for anyone to do web research. What I have learned is that the Chinese did greatly help Deadwood grow and prosper from 1876 through 1930. They had an extensive burial site on Mt. 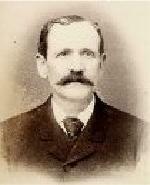 Moriah as shown in the 1906 picture. It is my understanding that nearly all the Chinese bodies have been removed from Mt. Moriah and returned to China for reburial so that their souls could be free in their homeland. While there were many Chinese in old Deadwood they diminished due to restrictive immigration that left too many Chinese males and too few females. The last of them left in 1930 and moved elsewhere. What other Chinese history I will provide are extracts and reference to the last issue of the Deadwood Magazine dated August 2009. 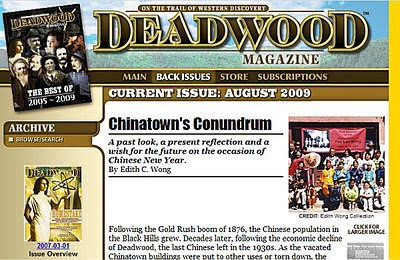 It is a sad community loss that Deadwood Magazine ceased publishing on that date. I and Bill Beshara visited Dustin and Laura Floyd last September 2009. See some pictures of our visit. 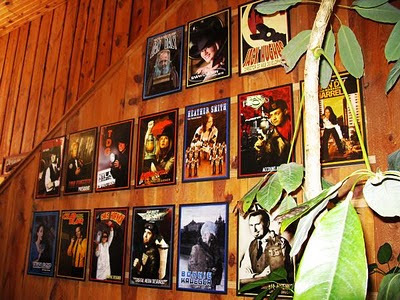 You will notice the Deadwood Magazine was published by TDG Communications, Inc. at 87 Sherman Street, Deadwood. In years past, this building was the Merritt Grocery and the old Swander’s Bakery was built right next on the right but torn down in late 1940s. A new brick building down the street, four buildings on the right, housed Swander’s Bakery until it closed in 1955. 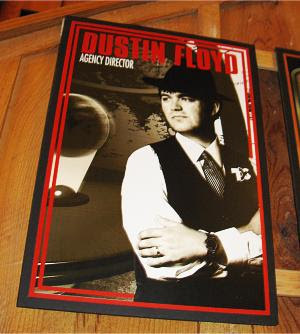 Dustin and Laura Floyd have always been personally and professionally helpful to both me and dhsclassmates web site. Edith C. Wong is a great-granddaughter of Fee Lee Wong, who was the proprietor of the Wing Tsue Emporium in Deadwood’s Chinatown district in the late 19th and early 20th centuries. Although she currently resides in California, she makes regular visits to South Dakota. This is her third contribution to Deadwood Magazine. “. . . 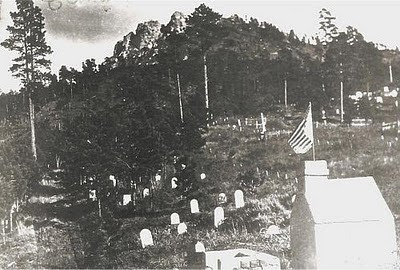 Following the Gold Rush boom of 1876, the Chinese population in the Black Hills grew. Decades later, following the economic decline of Deadwood, the last Chinese left in the 1930s. As the vacated Chinatown buildings were put to other uses or torn down, the facts and stories about Deadwood's Chinese were kept alive only by the locals: old-timers, descendants of pioneers, historians, museum curators, Days of '76 organizers & parade participants, and tour providers. Cultural celebrations, such as Chinese New Year, ceased. Over a century later, a tamer but no less involved annual celebration includes the entrance of the emperor and the empress, a short parade, fireworks, a lion dance, martial arts demonstrations, cultural education, a presentation related to the current year's animal of the Chinese Zodiac (2007 is the Year of the Pig/Boar) and ethnic cuisine at Chinatown Café. Only in recent years has it been conveyed to the world that historic Deadwood had a significant Chinese presence and Chinatown district. This has been done through archive work, including historic newspaper indexing and cemetery plot mapping, museum exhibits and presentations, historical symposiums, archaeological excavations, and print, radio, Internet, and the more popular television media. Despite these strides in the awareness, understanding and preservation of Deadwood's Chinese history, a tragedy occurred over the Christmas 2005 weekend: the demolition of the Wing Tsue buildings during property work done by the private owner (co-owner of the adjacent casino property). Nine months and two hearings later, the city was unsuccessful in its pursuit to hold the owner accountable for the loss of the last visible buildings of historic Chinatown. To this end, the city's National Historic Landmark designation, local historic preservation ordinances and the state's commission on gaming regulations appeared to have no bearing in this case . 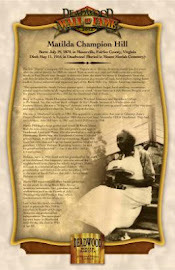 . ."
Select => Deadwood Magazine for the complete article. In today's world, I have discovered a new Chinese musical group called the “12 Girls Band” which are now 12 plus 1. Actually, they have a very large unseen support group of musicans, staging personnel, and management. The “girls” are very beautiful and talented. They have taken 1500 years of Chinese music culture and blended their sound into popular songs to share with the whole world. Their historical instruments provide a unique listening experience. Twelve Girls Band (simplified Chinese: 女子十二乐坊; traditional Chinese: 女子十二樂坊; pinyin: Nǚzǐ shí'èr Yùefǎng, sometimes abbreviated to 女樂 or 女乐) are an all female Chinese musical group that initially consisted of twelve members before the addition of a thirteenth. Twelve Girls Band use traditional Chinese instruments to play both traditional Chinese and Western song. Formed on June 18, 2001, the women were selected by audition from more than 4,000 contestants. Each woman is classically-trained, and the band members come from various conservatories in the People's Republic of China (PRC), including the China Academy of Music, the Chinese National Orchestra, and the Central Conservatory of Music. Chinese numerology gave Wang Xiao-Jing the idea for the Twelve Girls Band. When Xiao-Jing decided he wanted to create a female ensemble, he knew it needed 12 members. Per Chinese mythology it is the twelve jinchai (12 hairpins) representing womanhood. For the new project, the women were inspired by the art of the Yue Fang, the ensembles who played in the Tang Dynasty courts during the years A.D. 618 to 907. The group debuted their modern compositions on ancient instruments in China and Japan during the Northern summer of 2003. In Japan their debut album topped the charts for 30 weeks. Their debut album, entitled "Eastern Energy," was released in North America in August 2004 with cover versions of Coldplay's "Clocks" and Enya's "Only Time" included, and a massive television advertising campaign announcing the group's arrival. Among the instruments used by the women: erhu (Chinese fiddle), pipa (pear-shaped lute), guzheng (zither), yangqin (hammered dulcimer), dizi (transverse flute), and xiao (vertical flute). Occasionally, the duxianqin (single-stringed zither) and hulusi (three-piped gourd flute) are employed. The following videos are representative of their appeal. The first video provides a song with a slide picture presentation of some of the Girls and their instruments. 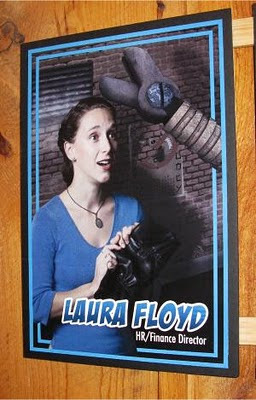 The second video is a favorite of mine, called "Shinning Energy". The third video is a classic favorite "El Condor Pasa". The last video is a John Denver Country Road version they call "Village Road". Just a note to remind y’all of Chinese New Year in Deadwood! The Chinese New Year Celebration in Deadwood on Saturday, March 6, 2010 traces its origin back to the late 1800’s and early 1900’s. At that time Deadwood had the second largest Chinese population in the United States, second only to San Francisco, thanks to the opportunities such as work in the gold mines and on the railroads. 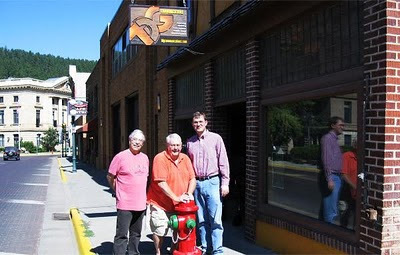 Today the culture of these proud people lives on in legend and memory in an event such as the Chinese New Year celebration, which has been held each year since 1990 at Miss Kitty’s Gambling Saloon/Chinatown Café at 649 Main Street in Deadwood. Because the Chinese Lunar Calendar is 2,637 years older than ours, this is the year 4647 and it is the Year of the Tiger. People born in this year or in 1926, 1938, 1950, 1962, 1974, 1986, or 1998 are forthright and sensitive, possess great courage. There will be various demonstrations by nearby martial arts groups in Miss Kitty’s Casino at 1 p.m. Chinese cuisine will be available during restaurant hours (11:30 a.m. to 10 p.m.) at the Chinatown Café.